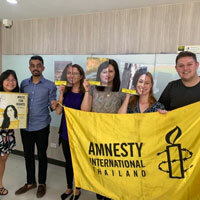 In December, graduate students in the MA in International Relations program at Webster University Thailand were hosted by Amnesty International Thailand. Amnesty International (AI) is the leading human rights organization and strives to advocate for human rights across the globe. Arranged by Professor Latifa Laghzaoui of Webster University, this meeting with AI was an opportunity to explore the organization’s work both in Thailand and internationally. Webster students were greeted with traditional Thai desserts and Amnesty International’s Activism and Human Rights Education Coordinator, Nuchnalin Leerasantana (Nuch). The meeting focused on AI’s work with urban refugees in Bangkok and also covered their human rights activism globally. Nuch discussed in detail the types of teachings the organization does with urban refugees in Bangkok. The students were given the opportunity to see first-hand the materials used in classrooms in Thailand to advocate for the rights of these vulnerable communities as well as break the stigma associated with this population. Webster University students participated in an activity where they learned about three people from three different countries who have been victims of human rights violations. The MAIR students wrote postcards to either the victim themselves or the family of the deceased victim. 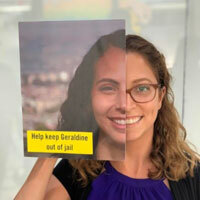 These postcards were also used as a pledge that the students would continue to work with Amnesty International to promote and advocate for human rights globally. Click here to learn more about Webster Thailand and the students' meeting with Amnesty International.